Nominate a staff member by Sept. 30. There are up to six awardees for each nomination term. 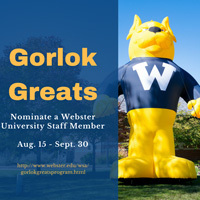 See additional criteria, guidelines and the nomination form at the WSA Gorlok Greats page. Nominations for Fall 2017 are being accepted from Aug. 15 through Sept. 30, 2017.